When John came to the throne in 1199, he was not only became the King of England but also the Duke of Normandy. However, within five years the French King Philip II had conquered the entire duchy. John would spend the rest of his reign organizing military campaigns to take it back, but he and his allies suffered a major defeat at the Battle of Bouvines in 1214. The leading barons and nobles of England were increasingly disappointed with John, not only for the loss of his territories in France, but also for squabbling with the church and his bad government. They pointed to the fact that King Henry I, about a century earlier, had agreed to a charter that had promised a less oppressive royal regime, and they wanted John to do the same. By the spring of 1215, various barons and nobles led armies to London, where they seized the city. Having lost control of his chief city, John knew he had to negotiate with the barons, or that worse could happen. On June 10, 1215, John met the rebel leaders at Runnymede, near the royal fortress of Windsor Castle, and talks began with the Archbishop of Canterbury acting as mediator. On June 15th the two sides came to an agreement. One common myth is that King John “signed” the charter, but he actually affixed the royal seal to the document, which was the common practice at the time. 5. 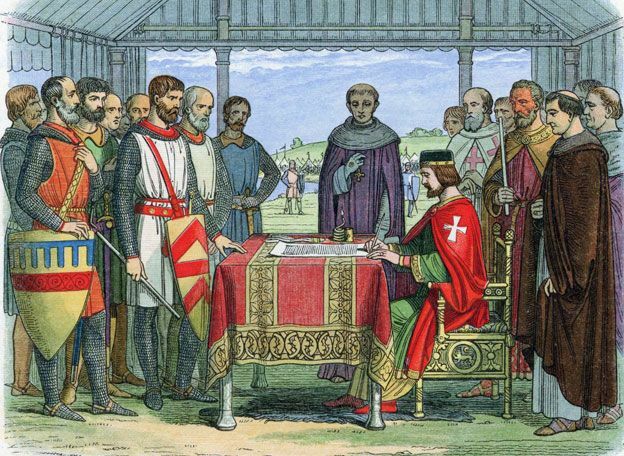 What was in Magna Carta? Neither side seems to intended to fulfill the agreement. The rebel barons did not give up London, and King John quickly looked for a way to renounce it. Once the Pope heard of it he immediately had it annulled, declaring that it was “null and void of all validity for ever.” By the fall of 1215 war broke out between the barons and the king. 8. King John dies – all Hail King Henry! The situation got so bad that the barons invited the crown prince of France to take over England, but on October 19, 1216 John died of dysentery. This left the throne to his nine-year old son, Henry III. Having a new king (who just a boy) was great news to most of the barons, who quickly ended their rebellion. Between 1216 and 1225 they also revised Magna Carta, removing certain clauses and making sure that others would be properly implemented. Magna Carta has been viewed as laying the foundation for the emergence of Parliament and Constitutional Monarchy in Britain, and also was influential in the American Revolution. There are four copies of the 1215 version of Magna Carta that survive to this day, one belongs to Lincoln Cathedral, another to Salisbury Cathedral and the other two can be found in the British Library.